"From the heart of the jungle comes a savage cry of victory. This is Tarzan, Lord of the jungle! From the black core of dark Africa... land of enchantment, mystery and violence comes one of the most colorful figures of all time. 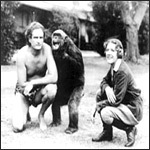 Transcribed from the immortal pen of Edgar Rice Burroughs-Tarzan, the bronzed, white son of the jungle!" (9/28/1932) Did the Bottle Really Go Overboard? Did the Bottle Really Go Overboard?